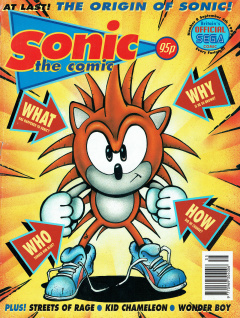 Sonic the Comic 8 is the eighth issue of the Sonic the Comic series by Fleetway. The non-comic 'zones' of this issue were the Control Zone (Introductions and Staff Details), Review Zone (Games across all current SEGA platforms reviewed on a % scale), News Zone (Information on upcoming SEGA events and products), Q Zone (Cheats, Game Genie codes and strategies for popular or requested games), and Speedlines (Reader letters and artwork, with replies from Megadroid, the comic's mascot character). As always, the Sonic-based story is the first comic of the issue. Sonic and Tails take Porker Lewis and Johnny Lightfoot into the Special Zone by means of a Star Post and Sonic's super speed. They arrive in one of the half-pipe courses (from Sonic the Hedgehog 2) that once held the Chaos Emeralds (until Sonic collected them all). After running off the end of the tube, the four friends glide through the space (alluding to the bizarre laws of physics in the Special Zone), and encounter a giant screen that calls itself the Omnipotent Omni-Viewer (but whom Sonic calls "Omni"). Sonic asks Omni to show his friends the true history of Robotnik and the origin of Sonic's own powers, which Omni is pleased to do. Robotnik was once a kindly scientist named Doctor Ovi Kintobor, who sought to eradicate all evil on Mobius. By using his Retro-Orbital Chaos Compressor (or ROCC), he used the Golden Rings of Mobius to channel the planet's evil into six emeralds: the Chaos Emeralds. However, without the seventh and final Chaos Emerald, the ROCC was very unstable. At this time, Sonic the Hedgehog was brown and very spiky, not blue and streamlined as he is today. Sonic somehow managed to find Kintobor's lab and the two became friends. Kintobor performed experiments on Sonic's super speed with his Kinetic Gyratoscope, which helped Sonic to run even faster, and in return Sonic used his speed to search for the seventh Chaos Emerald (although apparently without success). When Kintobor invented the friction-less Power Sneakers, Sonic was able to run so fast that he broke the sound barrier. The resulting sonic boom shattered the treadmill and turned Sonic into his more familiar blue form. Sonic continued spending time with Kintobor, judging that he was a nice guy. One day, when Kintobor went to get a snack from the fridge, he found that only a rotten egg was left. Going to find salt, Kintobor tripped on a cable and slammed into the ROCC, which exploded. The evil from the Chaos Emeralds combined with the rotten egg, transforming Ovi Kintobor into Ivo Robotnik. Once Omni has finished showing the story, he is suddenly compelled to draw Sonic and friends into his viewing surface. He tries to warn them to run away, but it is too late, and they are quickly absorbed and disappear. Robotnik himself appears in his Egg-O-Matic, claiming that the Omni-Viewer had no choice but to trap Sonic far in the future, where he will never be able to interfere in Robotnik's plans again! This issue establishes the STC backstories for Sonic and Doctor Robotnik. That Robotnik had once been Doctor Kintobor had previously been mentioned in Sonic the Comic #6, "Attack on the Death Egg". The Chaos Emeralds are mentioned for the first time, and their role in the series is explained: they were the vessels used by Kintobor to contain the evil of Mobius, which subsequently helped create Robotnik. Sonic reveals that he has collected the Chaos Emeralds and keeps them hidden somewhere safe. Later issues (Sonic the Comic #24 and #25, "The Sonic Terminator, Parts 1 and 2") will reveal that they are hidden in the North Cave in the Frozen Zone. Although Kintobor used only six Chaos Emeralds in his experiments, he reveals that there is a seventh he was unable to find. In Sonic the Comic #36, "Power of the Chaos Emeralds, Part 2", this seventh is revealed to be the Grey Emerald, and is in the possession of Knuckles the Echidna. Robotnik reveals that "all in the Special Zone" must obey his commands. Robotnik had revealed that he had a new Special Zone base in Sonic the Comic #4, "Day of the Badniks". The base itself is first depicted in Sonic the Comic #21, "Girl Trouble, Part 1". Robotnik arranges for Sonic to be sent into the future at the end of the issue. The following issue reveals that Omni only sent Sonic six months into the future, against Robotnik's wishes, but that even in this short space of time Robotnik has managed to conquer the planet. This issue shows Kintobor trip on a cable, causing the accident that turns him into Robotnik. Sonic the Comic #71, "The Return of Chaotix, Part 5" reveals that, in fact, it was a time-travelling Sonic that made Kintobor trip, because it was necesary in order to save Mobius in the future from the Brotherhood of Metallix. The story depicting Sonic's early history is picked up in Sonic the Comic #26, "Part 1: Kintobor spelled backwards is...", which shows the immediate aftermath of Robotnik's transformation. Kintobor refers to Sonic on their first meeting as Erinaceus europaeus, which is the Latin name for the species known as the West European Hedgehog, the hedgehog native to the UK. The name "Ovi", in addition to being "Ivo" in reverse, is Latin for eggs. Teenager Casey, having following two kids from school (Suzi and Brad) into the virtual reality game Wildside, has transformed into the samurai Red Stealth and is now fighting real enemies. Not only has his outfit changed, but his mind is filled with battle tactics and martial arts. He manages to defeat the pterodactyls, the scarecrows, and the robot dogs, but is taken unawares by the evil combine harvester. Nevertheless, with some encouragement from the Voice that first introduced him to the game, he manages to destroy that too. However, this sets alight to the confield that he is in, and he has to run for his life to escape the flame. Fortunately, he touches down on a strange pad that teleports him to a new area of the game: a filthy sewer. Red Stealth comes across an enormous, hideous monster. Although he is at first willing to part peacefully, it soon becomes clear that this is not an option: the beast has Suzi, and she needs his help! A street gang led by Ziggy attacks an old man named Ken and blows up his corner shop when he cannot pay protection money. Suddenly a van zooms towards them - they know it can't be the cops, since the police are all paid off. One gang member, Bananas, attempts to destroy the van with a bazooka, but he is knocked out from behind by Blaze Fielding and his shot goes wild. Blaze, along with the van's driver Max Hatchet, beat up the gang and they run off. Max collects the bazooka. The Demon Lord Grimomen grapples with Shion the Wonder Boy, revealing that the spell Grimomen cast earlier will soon turn Shion into Grimomen's slave. Shion fights back, casting a thunder spell that strikes Grimomen and completely burns away the demon's wings. Shion manages to regain control of his arm, which has already been turned demonic, but now Grimomen vengefully plans to kill Shion for destroying his wings. Shion uses a strength spell and manages to defeat Grimomen, which removes the spell of transformation over both Shion and the other human captives. However, as they try to escape, they are surrounded by more demon warriors, who are looking for their now-dead Demon Lord. This page was last edited on 16 April 2018, at 16:20.